We know all about the line of asterisks. You know, that line of asterisks that represents your hidden, super-secret password to your ftp server. Those asterisks are quite a reassurance, aren t they? You don t remember what your ftp password is, but your ftp program does, and that s good enough for you. But think about your doomsday scenario. What if your ftp program suddenly gets corrupted one day? What if you have a fire or a flood? Even if you back up your hard drive diligently, your backup drive is probably sitting right there in the same space as your pc. I haven t even mentioned outright physical theft of your equipment, or sabotage by evil forces both internal (disgruntled employee) and external (ninjas). Your ftp program, and the passwords that are stored within it, are far from invincible. 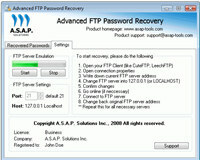 Advanced FTP Password Recovery is an utility that works under windows xp, . Estimated download time for Advanced FTP Password Recovery on a common adsl connection is less than a minute. 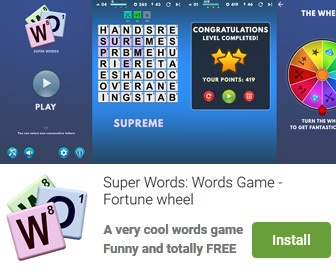 Version 1.2.5.8 was released four thousand two days ago by A.S.A.P. Solutions Inc.. Click the green download button to download it now.